1Department of Pharmacognosy and Phytochemistry, University of Delhi, DIPSAR, Sec-III, Pushp Vihar, M.B Road, Delhi-110017, INDIA. 2Professor, Department of Pharmaceutical Chemistry, University of Delhi, DIPSAR, Sec-III, Pushp Vihar, M.B Road, Delhi-110017, INDIA. 3Ph.D Scholar, Faculty of Pharmacy, Department of Pharmacognosy and Phytochemistry, Jamia Hamdard (Hamdard University), Hamdard Nagar, New Delhi - 110062, INDIA. 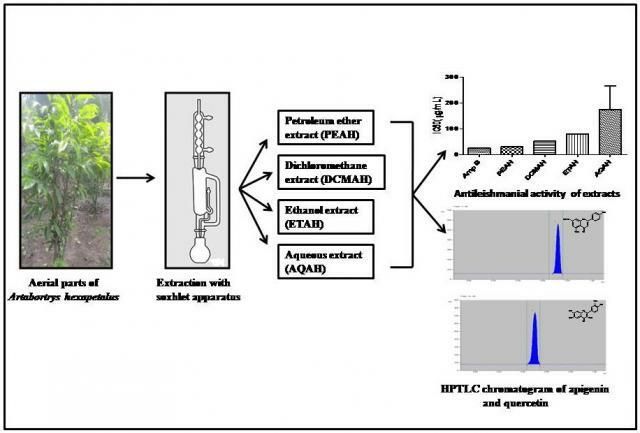 The present study was carried out to evaluate the quality control analysis and antiproliferative effects of petroleum ether, chloroform, ethanol and aqueous extracts of Swertia alata (family Gentianaceae) on Leishmania donovani. A basic, exact, quick and reproducible high performance thin layer chromatography (HPTLC) has been created for synchronous analysis of Oleanolic acid and Swertiamarin from S. alata. Bajaj S, Wakode S, Khan W. HPTLC Analysis and Antiproliferative Effect of Various Extracts of Swertia alata on Growth of Leishmania donovani Promastigotes in vitro. Pharmacognosy Journal. 2017;9(6s):s107-s116.